Rev. Msgr. Patrick F. O'Hare LL., D.
Msgr. Patrick F. O'Hare, LL.D., was an American priest and author of the nineteenth and twentieth centuries. His extensive work entitled The Facts about Luther was originally published by the Frederick Pustet Company, Ohio, in 1916. In it, Father O'Hare examines every important aspect of Luther's life and work to make known the truth about the legendary figure, through many of Luther's own words. The book received the Nihil Obstat and Imprimatur upon publication, and was retypeset from the revised edition in 1987. 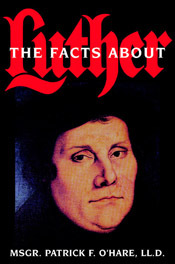 The Facts about Luther was retypeset once again by TAN in 2007.